Edited by Edward M. Mone, Manuel London, Ph.D.
By looking over the shoulders of fourteen forward-thinking, proactive HR professionals, you will gain a lifetime's worth of experience. These experts reveal how you can demonstrate your value to your organization by offering human resource solutions to organizational problems. 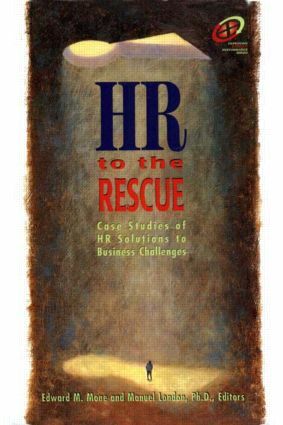 'HR to the rescue' tells you in complete detail exactly how the fourteen practitioners helped their companies achieve their strategic business objectives. You will see how they diagnosed the situations, determined what HR could contribute, designed new programs and processes to drive and sustain behavior change, and worked with organization leaders to ensure the success of their change management efforts. These insightful cases provide you with a true-to-life perspective. They illustrate what really happens in this imperfect world of organizations, where things rarely go as planned. Learn the lessons these practitioners have to share - and then step in, both affirmed and refreshed, to rescue your business with effective, integrated HR solutions. Human resource development and organizational transformation (Edward M. Mone and Manuel London); Applying human resource technologies in support of strategically driven transformational change at Thermo King (Lyle Yorks); Surveys and survey feedback: essential ingredients in organizational change (Dennis J. Adsit); A close look at organizational transformation: what works and what doesn't (Thomas Diamante); Developing the next generation of leaders: a new strategy for leadership development at Colgate-Palmolive (Jill Conner and Coleen A.Smith); Creating a global world-class investment bank through transformational human resource development (Stephen John); Transforming human resources to create a global world-class investment bank (Stephen John and Carol Gorelick); Career dynamics in a major commercial bank exposed to downsizing and strategic reorientation (Henrik Holt Larson, Lilian Morgensen and Tanya Rytterager Olsen); Today's special: career development in a Spaghetti organization: think the unthinkable in a dynamic network organization (Henrik Holt Larson and Stinne Madsen); Transformation in the pharmaceutical industry: HR's prescription for success (James B. Shillaber).